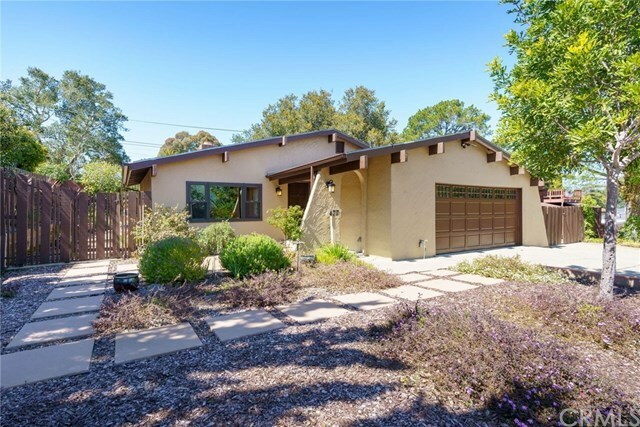 Immaculately maintained and updated 4 bedroom, 3 bath single level home within close proximity to Cal Poly, elementary schools and commercial services. Built in 1970, this +/- 1,984 square foot home is located off Ramona Drive down a semi-private driveway serving three homes. Including a 2-car garage along with off street parking for 4+ vehicles and optional RV/boat storage behind the gate, plus the ability to easily add a 5th bedroom makes this home a great opportunity for investment or a larger family. Common area spaces include a large living room with double sided fireplace, dining room with sliding door access to one of multiple patios and an open kitchen with breakfast bar seating opening to a bonus room/lounge area. The home has been updated with newer dual pane windows/sliders and recessed lighting throughout, updated plumbing and electrical, a new forced air heater and ducting (2013), renovated bathrooms with tiled showers and new irrigation lines with low maintenance landscaping. Other features include vaulted ceilings, multiple skylights letting in lots of natural light, newer laminate wood flooring and interior doors, rich kitchen cabinetry, built-in shelving and each bathroom providing dual sink vanities. With outdoor patio space off the dining room, lounge, master bedroom and front yard, there are no shortage of spaces to entertain and relax. This turnkey home is now ready for its next owner. Directions: Foothill going west, turn left on Broad, right on Ramona. Driveway entrance is on left hand side just past Verde Drive (long driveway to home).